If you are wondering, "what is hummus? ", then you have come to the right place. Hummus is a delicious, healthy snack made from mashed chick peas. If you have ever eaten in a Middle Eastern restaurant, you've probably already had hummus. Hummus is a dish that originated in the Middle Eastern part of the world. While hummus is made from several ingredients, the primary ingredient in hummus is chickpeas. Chickpeas are popular all over the world and in some places they are also called garbanzo beans. Chickpeas are a high protein legume that has been cultivated in the Middle East for thousands of years. At its very core, hummus is a dip or spread that you serve with other foods. It generally contains chickpeas, tahini (also known as Sesame seed butter), lemon juice, salt, garlic, olive oil and paprika. All of the ingredients are ground down to smooth paste and then seasoned to taste. Below you will find a simple and delicious hummus recipe, but for now let's learn a little bit more about this tasty treat. Now that you have answered the question "what is hummus?" What can you do with this delicious snack? 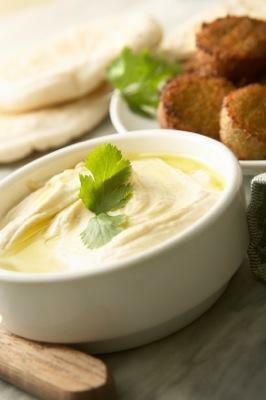 Well first off, hummus is commonly served with falafel, a spicy Middle Eastern dish that is also made of chickpeas. It can also be used to coat spicy meats, since the coolness of the spread helps to tame hot ingredients. Hummus is a great party dish! After you've drained and rinsed chickpeas, add all ingredients to the carafe of a blender. Scoop the hummus into a bowl and drizzle a small amount of olive oil over the top. Sprinkle with a pinch of paprika to add some color. Served with your choice of raw vegetables, such as carrots, broccoli, celery or whatever you like. Hummus will keep in the fridge for up to a week if kept in an airtight jar. Below you will find some wonderful hummus recipes that will cause you to fall in love with this Middle Eastern treat. Enjoy! A simple hummus recipe from Simply Recipes. Spicy hummus recipe can be particularly tasty. This recipe comes from Heidi at 101 Cookbooks. Roasted Red Pepper Hummus is a rich, colorful appetizer. It goes well on both bread and veggies.